In the illustration above we see alternatives (and their statistical breakdowns) to our own 8.Bd2, all taken from top-level play. However, there is a way to use ChessBase 11 to automatically identify an opening novelty from a game, plus insert a game citation (variation and reference to another game) into our game score. This new feature in ChessBase 11 is called “Novelty annotation”. Your computer requires an Internet connection to make use of this new feature. 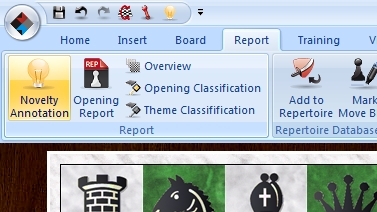 When you click this button, ChessBase 11 will connect to an online database (which is updated regularly with the latest games). It will identify the opening variation played in your game, look for games using similar variations and, after finding a match, it will mark a move in your game as a “novelty” (a new move or deviation from known theory) and insert a game citation based on opening practice, that is, actual games played under tournament conditions. ChessBase 11 has checked the online database and identified 8…Bd7 as the novelty, plus provided us with a game in which the move 8…e6 was played instead. But wait a minute! When we used Powerbook manually, didn’t it show 8.Bd2 as the novelty in the game? Yep, it sure did. But there’s an explanation for this. Fritz Powerbook is derived exclusively from master and grandmaster games. Now look at the game citation from the online database: the players were rated below 2000. So why would such a game be in the online database? Because the game is from a Four Nations Chess League tournament, part of an annual team competition which is a pretty big deal in Europe (as quite a few players from outside Great Britain participate). Since ChessBase’s master databases (both online and on disk) provides complete tournaments whenever possible, this game would naturally be in the master database. But this also suggests to us that a combination of the two approaches might be used when researching our own games: we can manually use Powerbook to find the best line of play based strictly on games played by masters and GMs, while the online database search provided by ChessBase 11’s new “Novelty annotation” feature can often pull in additional information which wasn’t included in Fritz Powerbook. ChessBase 11 is available right now from USCF Sales.